A brush (or two) with death didn’t slow Professor Lui Pao Chuen down. Having seen engineering in Singapore grow from nuts and bolts to big data, the former Chief Defence Scientist and now Advisor to the Ministry of National Development is still eager to see our engineering capabilities reach new heights. 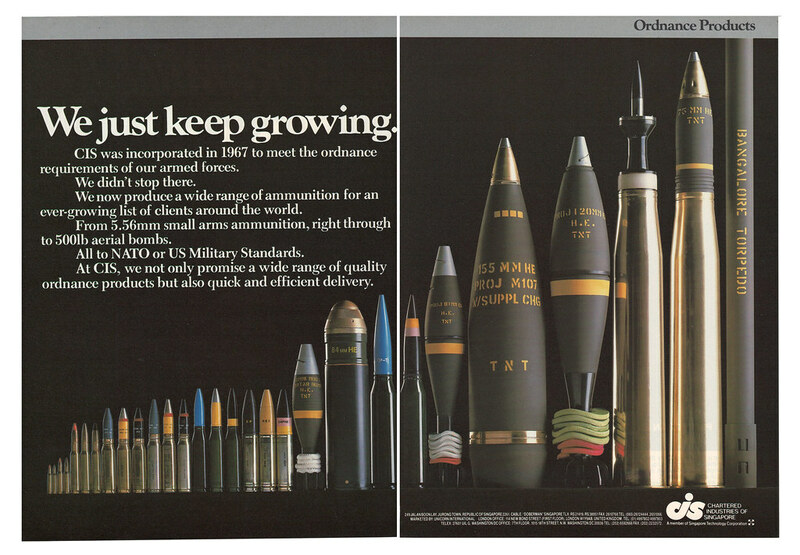 A CIS advertisement from the September 1987 issue of the International Defense Review. “Singapore design” today conjures up images of porcelain plates and nostalgia-inspired souvenirs, but few would think of guns, tanks and naval ships. Over the decades, this UNESCO Creative City of Design has grown from a mere importer of military equipment to one designing and selling them as well. These include the Singapore Assault Rifle – 21st Century (SAR 21), the Bionix armoured fighting vehicles and the Endurance-class landing platform dock ships—all equipment Singaporean men, who have to serve a mandatory two-year military service, would be familiar with today. 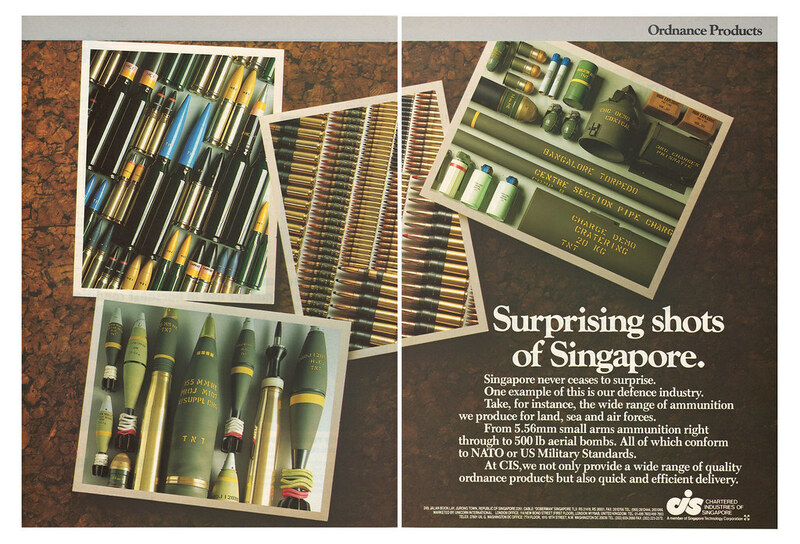 As early as 1966, the newly independent nation-state began developing an armament industry with the establishment of the Chartered Industries of Singapore (CIS). Its first products were manufacturing 5.56 mm ammunition for the Colt AR-15, the then standard rifle for the Singapore Armed Forces, and minting Singapore coins. Over the decades, the defence company took on bigger equipment, eventually developing Singapore’s first locally designed artillery weapon, the Field Howitzer 88 (FH-88). The plan to develop the country’s very own 155 mm/39-calibre towed gun in 1988 was in response to the low reliability and high cost of servicing the SAF’s existing Israeli-designed and developed guns. By the nineties, the FH-88 became fully operational in the Singapore military, and the success helped CIS create the FH-2000 and Singapore Self-Propelled Howitzer 1 (SSPH 1) Primus. An advertisement for the FH-88 from a 1989 issue of the International Defense Review. By then, Singapore’s defence industry had also grown considerably with over 16 companies serving the military in areas such as aerospace, marine and even food. In an effort to rationalise the industry so as to cut waste and better coordinate activities, the Ministry of Defence drew up The Singapore Defence Industries Charter in 1987. 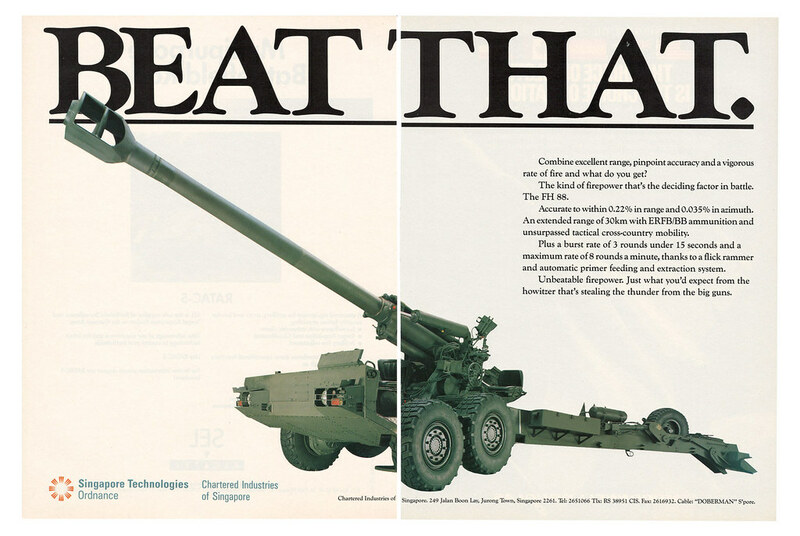 This essentially pushed the industry towards commercialisation, which probably explains the genesis of these advertisements published in the monthly military magazine, International Defence Review. In 1989, the Singapore Technologies (ST) group was formed as the umbrella corporation for the many local defence companies including CIS. Known today as ST Engineering, the country’s sole arms manufacturer was the only firm from Southeast Asian on the Stockholm International Peace Research Institute’s (SIPRI) list of the world’s top 100 defence manufacturers in 2012. According to the institute, the company owned by Temasek Holdings has sold equipment to Indonesia, Chad, Nigeria, the Philippines, the United Arab Emirates and Brazil. Although the multi-billon dollar company refuses to divulge details, it has trumpeted its 2008 success in supplying the designed-in-Singapore Bronco All Terrain Tracked Carrier (ATTC)¹ to the British army. A CIS advertisement from the November 1986 issue of the International Defense Review. While Singapore still imports most of its military equipment—the country accounted for 4 per cent of global weapons import and is the fifth-largest buyer in 2012 according to SIPRI—ST Engineering continues to develop equipment tailored to the needs of the country’s defence. Most recently, its marine arm designed and built the Littoral Mission Vessel, the country’s first locally-designed navy vessels. ST Engineering has also diversified beyond defence, bringing its design and engineering capabilities into other sectors of Singapore too. In 2014, its subsidiary Innosparks worked with local industrial design consultancy STUCK to create the Air+ Smart Mask. This was the world’s first protective mask with a microventilator and one of the few made for school children. This transfer of design knowledge from a military to an everyday context is reminiscent of how American designers Charles and Ray Eames work for the military during the Second World War. By helping develop wooden medical splints and even a pilot seat, they gained the knowledge to apply to their later furniture designs, including the now iconic Lounge Chair Wood. One wonders what parallel examples are there in Singapore’s design history too? There was a dispute that this was designed in Singapore by Swedish defence firm Hagglunds. More at Senang Diri. History of Singapore Technologies by Infopedia.